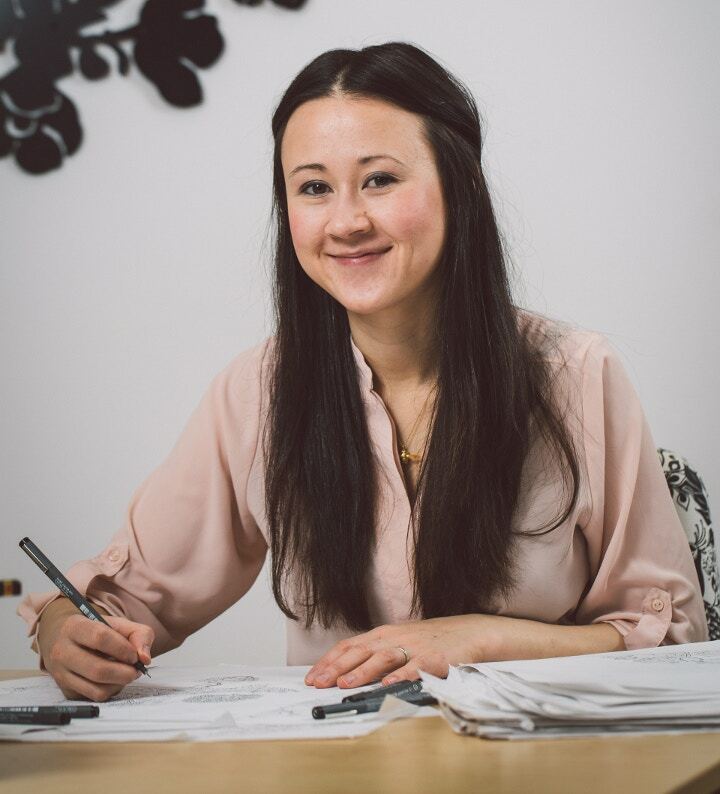 Illustrator Johanna Basford is known for her wonderfully intricate colouring books for adults: Secret Garden and Enchanted Forest. 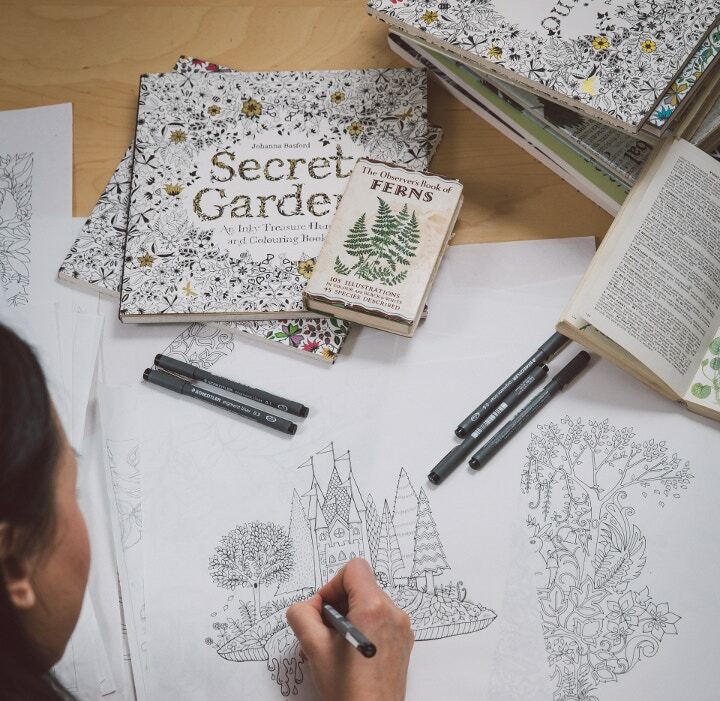 Colouring for grown ups has been thrust into the limelight in recent months for its therapeutic and stress relieving qualities but it was Johanna who first pitched the idea to her editors at Laurence King, before the colouring craze took hold. Johanna lives in rural Aberdeenshire with her husband, baby daughter and crazy dog Simcoe. She studied Textile Design at Duncan of Jordanstone College of Art and Design in Dundee, and her magical, winding illustrations have captured the hearts of people across the globe. We caught up with Johanna to find out what inspires her drawings, and what art materials she uses to create her inky wonderlands. Hi Johanna! What gave you the idea for a coloring book for adults? One of the people who downloaded my ‘Owls in a Tree’ illustration was my soon to be editor at Laurence King. She got in touch and asked if I would like to create a children’s colouring book. 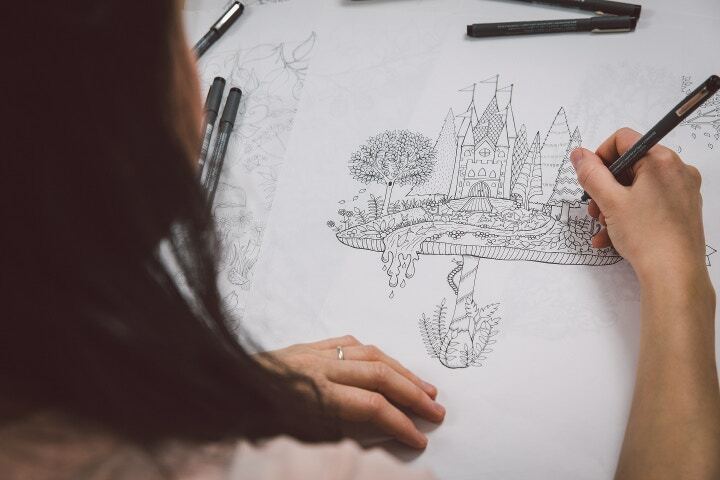 I pitched the idea of an adult colouring in book – my signature style of illustration was super intricate, hand drawn, black and white work and for years my clients have been telling me that they wanted to colour in my drawings. This was 4 years ago, before the worldwide trend for adult colouring kicked off, so you can imagine how quiet my editor went. They weren’t sure if colouring in for grown ups was silly and if there would be any demand for books like that. Why do you think so many adults are colouring in? In terms of why I think people are embracing the colouring craze, I think there’s been an underground adult colour shading movement for years, it’s just more recently that it’s come to light and become socially acceptable! I get emails from people saying until my books came out that they used to wait till the kids went to bed, then got their books out and had a sneaky colouring-in session! Firstly it’s a great way to de-stress. That notion of being ‘in flow’ and completely absorbed in a task - particularly an analogue task that doesn’t involve a screen - is just so soothing. Everyone’s lives are now so busy and so digital, I think colouring offers a welcome opportunity to unplug and allow yourself to be completely immersed in a task without the constant chatter of Twitter or the lure of Facebook. This is how I feel when I’m drawing, blissfully submerged! What inspired your Secret Garden and Enchanted Forest books? Why do you think your illustrations, in particular, appeal to adults? I think a good grown-up colouring book should contain a mini work of art on each page. A variation in pattern, motifs and panoramic illustrations keeps things interesting whilst an intricate level of detail makes sure the grown up wielding the felt tip pen or colouring pencil is adequately challenged! What is it you like about the Staedtler Pigment Liners? These little grey pens are my bread and butter. I use them to draw almost everything in the studio, including the original artwork for this book. The opaque ink runs smoothly from the delicate nibs and allows you to add intricate monochrome detail with lots of precision. Love them! Why do you prefer working with pencil and pen as opposed to digitally? 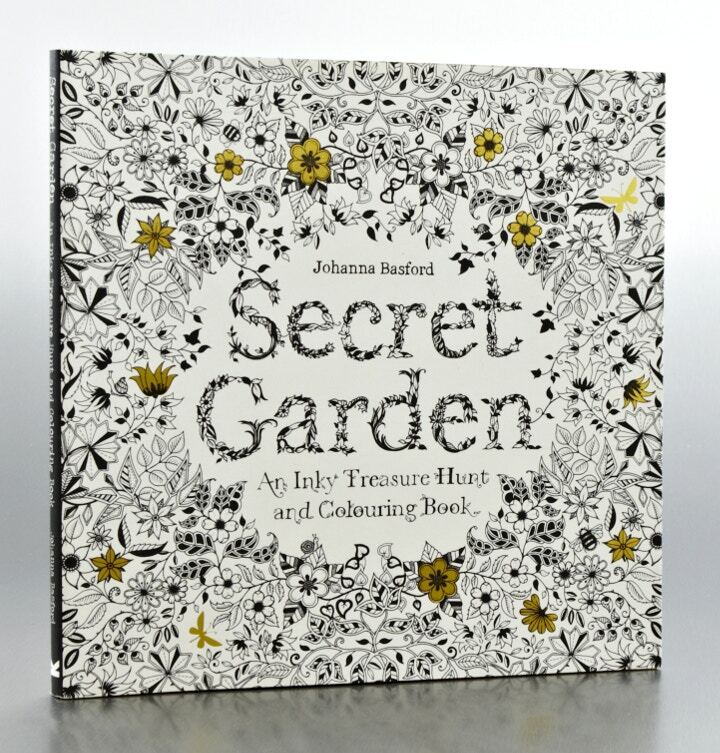 Shop for Johanna Basford's Secret Garden and Enchanted Forest, and browse her beloved Staedtler Pigment Liners, both online and in-store at Cass Art. Images courtesy of Laurence King Publishing.